Marie A. Spano, MS, RD, CSCS, CSSD, is one of the country’s leading sports nutritionists. She is the sports nutritionist for the Atlanta Hawks, Atlanta Falcons and Atlanta Braves. She combines science with practical experience to help Olympic, professional, and recreational athletes implement customized nutritional plans to maximize athletic performance. Also a nutrition communications expert, Spano consults with leading food, beverage, and supplement companies regarding public relations and communications strategies. Spano enjoys the challenge of communicating scientific information in an approachable, understandable format to a variety of audiences. She has appeared on CNN as well as NBC, ABC, Fox and CBS affiliates, and authored hundreds of magazine articles, trade publication articles, book chapters, and marketing materials. A three-sport collegiate athlete, Spano earned her masters in nutrition from the University of Georgia and her bachelor’s degree in exercise and sports science from the University of North Carolina, Greensboro (UNCG), where she also ran Division I cross-country. Her experiences as a college athlete provides effective perspective to work with athletes of all levels, especially student athletes, by providing a first-hand understanding of how the demands of athletics, psychological aspects of injury, and sleep, recovery, and sound nutrition can impact an athlete’s overall well-being and performance. My God – This could have been me writing this. It sounds just like me. I’ve not dropped 50lbs but I’ve been working out for the better of 25yrs and have not learned how to let go of the “diet” mentality. I’m working with a trainer right now and my goal is to get as lean as my body will comfortable take me while eating a good clean diet. I don’t want to be a carb-a-phobic any longer I just want to eat healthy clean diet. Just reading your thoughts on the blood type diet. Have you ever tried it??? 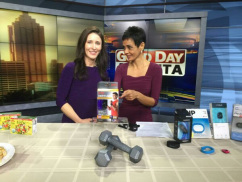 Thank you for your segment on WBTV on Sunday morning. Unfortunately I missed the supplement that was recommended for bad knees. Could you please give me that information. Thank you again. Yes, I will email you now! Is there really a supplement that would help with pain in the knees?? Would love to know too!! I don’t know what Dr Spano recommends, but I had a double hip replacement surgery at 35 and arthritic knees that the doctor told me need replacing. I’ve been on a keto diet for a long time, then switched to carnivore (all meat). My inflammation has never been lower. I supplement with meriva curcumin (the only type that seems to be absorbed by humans) CBD and Kratom. CBD and Curcumin lower inflammation. Kratom interacts with the mu opioid receptor to relieve pain like opioids do, but is only about as addictive as coffee. I made a documentary about kratom with some of the top scientists in the world on it. It’s called A Leaf of Faith if you’re interested, but it’s not why I posted this. I believe this protocol got me from barely being able to function back to deadlifting 500 lbs for 5 reps. I’m in the best shape of my life and my bloodwork was excellent. Hopefully that helps. Thank you for sharing Chris! I’m going to use part of this in an upcoming post about diets! Discovered your site thanks to a recent ESPN article talking about your recent employer-ship to the Atlanta Falcons. Loved your articles and I will be using a lot of this information for myself. An extremely late thank you for visiting my site! Somehow I never saw several comments from months ago!